From tree planting to felling - Conservation and Trees offers advice, management plans and practical management. With many years of tree planting experience, we offer careful and efficient tree planting. Our four foot wide low impact tractor is perfect for controlling vegetation between young trees, encouraging strong growth. Qualified pruners with NPTC - small tree pruning to help shape your trees the way you need them. Qualified with NPTC let us take down your trees safely. Conservation and Trees can come to your site and process your firewood for the winter. Equiped with chainsaw/sawhorse and mobile logsplitter we can help out with your winter heating. We can help return your old apple tree to a fine cropping example, or help train your young trees to fruit productively. 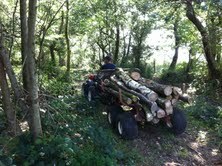 Small woodland management is a speciality for Conservation and Trees. 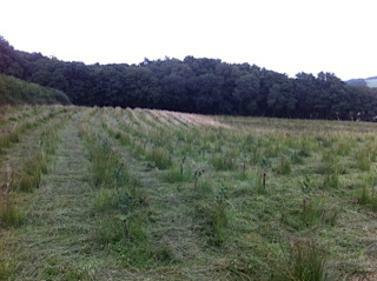 We offer grant advice, management plans and practical management such as thinning, coppicing and low impact logging.